Violation of any of the terms below will result in the termination of your Account. While Tanner Gun Show prohibits such conduct and Content on the Service, you understand and agree that Tanner Gun Show cannot be responsible for the Content posted on the Service and you nonetheless may be exposed to such materials. You agree to use the Service at your own risk. We collect information from you when you register on our site, place an order, subscribe to our newsletter, respond to a survey, fill out a form or other connections, such as social media, or APIs. To send periodic emails. The email address you provide for order processing, may be used to send you information and updates pertaining to your order or request, in addition to receiving occasional company news, updates, promotions, related product or service information, etc. Note: If at any time you would like to unsubscribe from receiving future emails, we include detailed unsubscribe instructions at the bottom of each email. Please also visit our Terms and Conditions section establishing the use, disclaimers, and limitations of liability governing the use of our website below on this page. This policy was last modified on Tuesday, December 2, 2014. Your access to and use of Tanner Gun Show is subject exclusively to these Terms and Conditions. You will not use the Website for any purpose that is unlawful or prohibited by these Terms and Conditions. By using the Website you are fully accepting the terms, conditions and disclaimers contained in this notice. If you do not accept these Terms and Conditions you must immediately stop using the Website. You are responsible for maintaining the security of your account and password. Tanner Gun Show cannot and will not be liable for any loss or damage from your failure to comply with this security obligation. You may not use the Service for any illegal or unauthorized purpose. You expressly understand and agree that Tanner Gun Show shall not be liable for any direct, indirect, incidental, special, consequential or exemplary damages, including but not limited to, damages for loss of profits, goodwill, use, data or other intangible losses (even if Tanner Gun Show has been advised of the possibility of such damages), resulting from your use of the API or third-party products that access data via the API. Abuse or excessively frequent requests to Tanner Gun Show via the API may result in the temporary or permanent suspension of your account’s access to the API. Tanner Gun Show, in its sole discretion, will determine abuse or excessive usage of the API. Tanner Gun Show will make a reasonable attempt via email to warn the account owner prior to suspension. Tanner Gun Show reserves the right at any time to modify or discontinue, temporarily or permanently, your access to the API (or any part thereof) with or without notice. Tanner Gun Show will never ask for your credit card details and we advice our customers to not enter their credit cards details on Tanner Gun Show website or by submitting such details in any other form. All supplied sensitive/credit information is transmitted via Secure Socket Layer (SSL) technology and then encrypted into our Payment gateway providers database only to be accessible by those authorized with special access rights to such systems, and are required to keep the information confidential. Periodic payments (e.g. website hosting, consulting, subscription services, et al.) will be payable as per the terms of your agreement. If terms are not stated, you commit to a 12-month term payable upfront, which renews annually unless terminated 30 days prior to expiration of prior agreement term. Downgrading your Service may cause the loss of Content, features, or capacity of your Account. Tanner Gun Show does not accept any liability for such loss. You are solely responsible for properly canceling your account. You may cancel by Email (support@tannergunshow.com) – no cancellations will be processed by phone – your request must be made digitally. Tanner Gun Show, in its sole discretion, has the right to suspend or terminate your account and refuse any and all current or future use of the Service, or any other Tanner Gun Show service, for any reason at any time. Such termination of the Service will result in the deactivation or deletion of your Account or your access to your Account, and the forfeiture and relinquishment of all Content in your Account. Tanner Gun Show reserves the right to refuse service to anyone for any reason at any time. Tanner Gun Show reserves the right at any time and from time to time to modify or discontinue, temporarily or permanently, the Service (or any part thereof) with or without notice. Prices of all Services, including but not limited to periodic subscription plan fees, are subject to change upon 30 days notice from us. Such notice may be provided at any time by posting the changes to the the Tanner Gun Show Site (tannergunshow.com) or on the Service itself. Tanner Gun Show shall not be liable to you or to any third party for any modification, price change, suspension or discontinuance of the Service. Tanner Gun Show is committed to compliance with U.S. copyright law. Under the Digital Millennium Copyright Act (17 U.S.C. ยง 512), copyright owners have the right to notify Tanner Gun Show if they believe that an account user of a Tanner Gun Show application(s) has infringed the copyright owner’s work(s). Notifications of claimed copyright infringement must be submitted in writing to Tanner Gun Show’s designated agent for receiving such notifications. 3. Identification of the material that is claimed to be infringing or to be the subject of infringing activity and that is to be removed or access to which is to be disabled, and information sufficient to permit Tanner Gun Show to locate the material. 4. 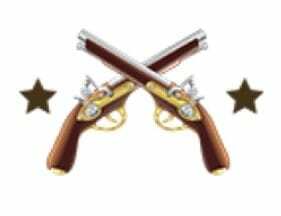 Information reasonably sufficient to permit Tanner Gun Show to contact the complaining party, such as an address, telephone number and if available, an electronic mail address at which the complaining party may be contacted. All copyright, trade marks and all other intellectual property rights in the Website and its content (including without limitation the Website design, text, graphics and all software and source codes connected with the Website) are owned by or licensed to Tanner Gun Show or otherwise used by Tanner Gun Show as permitted by law. Tanner Gun Show does not pre-screen Content, but Tanner Gun Show and its designee have the right (but not the obligation) in their sole discretion to refuse or remove any Content that is available via the Service. The look and feel of the Service is copyrighted by Tanner Gun Show. All rights reserved. You may not duplicate, copy, or reuse any portion of the applications HTML/CSS or visual design elements without express written permission from Tanner Gun Show. The look and feel of all website templates (aka themes) is 100% owned by Tanner Gun Show. You may not duplicate, copy, or reuse any portion of our provided website templates without written permission by Tanner Gun Show. In cases where the rights are available for purchase, the client may transfer their website design to another partner only with written permission from Tanner Gun Show. The contents of Tanner Gun Show website do not constitute advice and should not be relied upon in making or refraining from making, any decision. All material contained on Tanner Gun Show is provided without any or warranty of any kind. You use the material on Tanner Gun Show at your own discretion. 1. change or remove (temporarily or permanently) the Website or any part of it without notice and you confirm that Tanner Gun Show shall not be liable to you for any such change or removal and. Tanner Gun Show Website may include links to third party websites that are controlled and maintained by others. Any link to other websites is not an endorsement of such websites and you acknowledge and agree that we are not responsible for the content or availability of any such sites. Customers who have purchased a pre-built template may not use the template and/or design outside of Tanner Gun Show. Website templates are licensed on a monthly basis and part of the monthly fee which includes access to the Online Business CMS solution. All website template designs are fully owned by Tanner Gun Show. Client may use these pre-build website designs for as long as they are clients but may not copy, re-use or re-sell these website templates in any way. Usage rights may be purchased at the sole discretion of Tanner Gun Show. 1. Throughout this Website you may find links to third party websites. The provision of a link to such a website does not mean that we endorse that website. If you visit any website via a link on this Website you do so at your own risk. 3. By linking to this Website in breach of our terms, you shall indemnify us for any loss or damage suffered to this Website as a result of such linking. Technical support is only provided to paying account holders and is only available via the Client Support Center which is located within your dashboard panel. Tanner Gun Show provides additional support via our Support Ticketing area for an additional fee. You understand that Tanner Gun Show uses third party vendors and hosting partners to provide the necessary hardware, software, networking, storage, and related technology required to run the Service. You must not modify, adapt or hack the Service or modify another website so as to falsely imply that it is associated with the Service, Tanner Gun Show, or any other Tanner Gun Show service. You agree not to reproduce, duplicate, copy, sell, resell or exploit any portion of the Service, use of the Service, or access to the Service without the express written permission by Tanner Gun Show. Verbal, physical, written or other abuse (including threats of abuse or retribution) of any Tanner Gun Show customer, employee, member, or officer will result in immediate account termination. You understand that the technical processing and transmission of the Service, including your Content, may be transferred un-encrypted and involve (a) transmissions over various networks; and (b) changes to conform and adapt to technical requirements of connecting networks or devices. If your bandwidth usage exceeds 300 MB/month, or significantly exceeds the average bandwidth usage (as determined solely by Tanner Gun Show) of other Tanner Gun Show customers, we reserve the right to immediately disable your account or throttle your file hosting until you can reduce your bandwidth consumption. Tanner Gun Show does not warrant that (i) the service will meet your specific requirements, (ii) the service will be uninterrupted, timely, secure, or error-free, (iii) the results that may be obtained from the use of the service will be accurate or reliable, (iv) the quality of any products, services, information, or other material purchased or obtained by you through the service will meet your expectations, and (v) any errors in the Service will be corrected. You expressly understand and agree that Tanner Gun Show shall not be liable for any direct, indirect, incidental, special, consequential or exemplary damages, including but not limited to, damages for loss of profits, goodwill, use, data or other intangible losses (even if Tanner Gun Show has been advised of the possibility of such damages), resulting from: (i) the use or the inability to use the service; (ii) the cost of procurement of substitute goods and services resulting from any goods, data, information or services purchased or obtained or messages received or transactions entered into through or from the service; (iii) unauthorized access to or alteration of your transmissions or data; (iv) statements or conduct of any third party on the service; (v) or any other matter relating to the service. The failure of Tanner Gun Show to exercise or enforce any right or provision of the Terms of Service shall not constitute a waiver of such right or provision. The Terms of Service constitutes the entire agreement between you and Tanner Gun Show and govern your use of the Service, superseding any prior agreements between you and Tanner Gun Show (including, but not limited to, any prior versions of the Terms of Service). Questions about the Terms of Service should be sent to Support[at]tannergunshow[dot]com. 1. The Website is provided on an AS IS and AS AVAILABLE basis without any representation or endorsement made and without warranty of any kind whether express or implied, including but not limited to the implied warranties of satisfactory quality, fitness for a particular purpose, non-infringement, compatibility, security and accuracy. 2. To the extent permitted by law, Tanner Gun Show will not be liable for any indirect or consequential loss or damage whatever (including without limitation loss of business, opportunity, data, profits) arising out of or in connection with the use of the Website. 3. Tanner Gun Show makes no warranty that the functionality of the Website will be uninterrupted or error free, that defects will be corrected or that the Website or the server that makes it available are free of viruses or anything else which may be harmful or destructive. 4. Nothing in these Terms and Conditions shall be construed so as to exclude or limit the liability of Tanner Gun Show for death or personal injury as a result of the negligence of Tanner Gun Show or that of its employees or agents. You agree to indemnify and hold Tanner Gun Show and its employees and agents harmless from and against all liabilities, legal fees, damages, losses, costs and other expenses in relation to any claims or actions brought against Tanner Gun Show arising out of any breach by you of these Terms and Conditions or other liabilities arising out of your use of this Website.